A stylish men's watch from Tissot. Featuring a classic design this watch has a stainless steel bracelet, round black dial and chronograph. 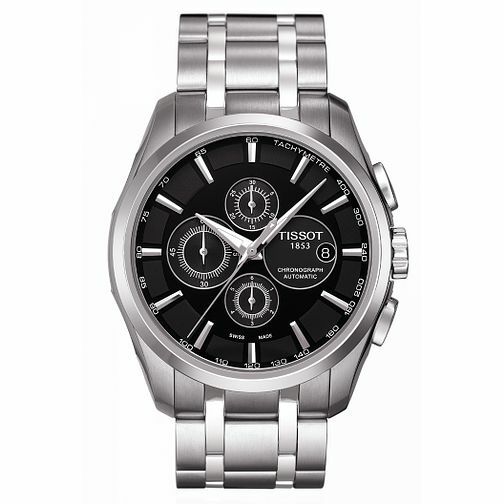 Tissot men's stainless steel bracelet watch is rated 3.8 out of 5 by 8. Rated 1 out of 5 by Anonymous from Doesnt keep time Looks amazing but this watch is useless ive bought it 2s thinking first one was just a faulty one but 2nd turned out even worse this watch is swiss movement it should have one of the best movements instead it goes back like 30 seconds everyday its absolutely garbage i would avoid if i was you. Rated 3 out of 5 by Anonymous from Beautiful best watch ive ever bought ! Amazing watch ive had rolexes citizens armani seiko the lot but nothing impresses me as such a beautiful piece has a nice weight to it looks good good price no down side. Thanks tissot !